The 2011 Virginia Travel Guide features amusement park thrills, beaches, wineries and history to bring loved ones together on a memorable vacation. Virginia has just released the 2011 Virginia is for Lovers travel guide, with more than 200 pages of amusement parks, beach getaways, wineries, history and outdoor adventure vacation ideas. Special sections devoted to family fun, small town discoveries and regional itineraries give visitors a lot to love about vacationing in Virginia. 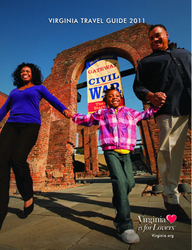 The guide is available for free by request at http://www.Virginia.org or at any Virginia Welcome Center. Virginia's new travel guide features timeless icons as well as new attractions and destinations where loved ones can completely connect on a memorable vacation. Four different cover designs - beach fun, history and heritage, wine travel and kayaking, showcase the diverse beauty of Virginia. 2011 major milestones including the 75th anniversaries of Shenandoah National Park and Virginia State Parks are an opportunity for families to reconnect in Virginia's great outdoors. The new Virginia travel guide also marks the 150th anniversary of the American Civil War and Emancipation, with commemorative events and new exhibits planned throughout Virginia. Each of Virginia's distinct regions is featured in the Virginia Travel Guide, with stunning photography and helpful "must see" local attractions. Find hotels, restaurants and Virginia Green certified attractions to make the most of a visit to Virginia. Helpful resources from regional maps, transportation options, and annual event listings make the Virginia Travel Guide a great resource for vacation planning. Love is at the heart of every Virginia vacation. Visit http://www.Virginia.org for more information or call 1-800-VISITVA to request a free, Virginia is for Lovers travel guide. Connect with Virginia on Facebook at http://www.facebook.com/VirginiaisforLovers or follow on Twitter at http://www.twitter.com/VisitVirginia.